You are here: Home » Have a Fab Fourth! July 4th is about our Independence on Earth. We are very, very fortunate to have it! To learn more about this event that took place in 1776, please peruse Happy Birthday, America It is a wonderful site with patriotic music to enjoy, the story of our Independence, fireworks, Mom’s Apple Pie, and even a downloadable Independence Fireworks movie. Hear Lee Greenwood sing his famous God Bless the USA again. Songs of America has a list of rousing music as well. Wilstar does, too! Light up your Fourth with these cards. If you’d like some graphics for this day, there are some here for you. Our Statue of Liberty is more important than ever! Learn all about this National Monument and Ellis Island. Then learn more about what the Seven Spikes of Lady Liberty’s Crown mean and what it’s made of. Our heritage and the original documents are archived at The National Archives the resolution for independence approved July 2, 1776; the Louisiana Purchase; and a photographic record of our discoveries, our centuries’ achievements, and the highlights of everything that makes us proud and wonderful Americans, all the originals are displayed here. Ever wonder what happened on YOUR birthday or what other famous folks were born on your birthday or anniversary? Pick a date and this site will tell you! For a history of the first flag, the Betsy Ross Homepage has a flag picture gallery. And the story of Old Glory has a quiz to test your flag IQ.The Smithsonian has our original flag. And find out flag etiquette and other facts about our flag. Then go to the Star Spangled Banner to see how this flag inspired our national anthem. John Philip Sousa moves listeners to tap their feet to his rousing The Stars and Stripes Forever . You can download and print an American Flag here. Whitehouse Tour – ever want to take one, but it’s too far? This will take you from room to room. I know you know how the Liberty Bell got its crack, but here’s more to know! The story of Paul Revere, including the sound of hoofbeats! and then read the Midnight Message of Paul Revere. it is. And last but not least Have a Capitol Fourth! Here’s the story about Arizona becoming the last contiguous state to join the union and our own Arizona flag design. And here’s a look at our state quarter. To check out your state and your flag (plus every other thing you want to know about your state), check out 50States. And hopefully you’ve been able to watch the new series, How States Got Their Shape, a fun way to learn your history! Find out more about how things were here in the Valley that first 4th of July, check out and then discover some facts about The Way We Were. And then check out Our Flag … Did You Know? And because our independent spirit enables us to achieve in space and technology, I thought it appropriate to include some celestial sites as well this Fourth. The Planetary Society is your connection to the exploration of the cosmos and the search for extraterrestrial life and intelligence. For a wide variety of space coverage and the latest launches, including the latest Hubble is offering, the blog at Universe Today is excellent! For awesome, awesome photos that Hubble has captured, visit Hubble Heritage. Some other good Hubble websites are The Hubble View of the Universe and its Gallery. There’s even more at the Hubble View. NASA scientists wanted to throw a rock at a comet. Check out Deep Impact to find out more. Then get an update to see if they were able to punch a hole in the belly of the comet. Did secrets of the solar system locked away for billions of years spill out? Tune in to find out. Ready to explore new horizons? The New Scientist Space website will take you on your journey. Enjoy VRML robots, building satellites, splashing color and spinning DNA here at The Tech Museum of Innovation. This is a must see! The Space Wanderer will take you on a historic journey through the Universe. Then check out their Gallery & Space photos. Looking for an asteroid? Here’s some used ones from Nine Planets. Check out Asteroids and Comets for the latest news. To learn how we might “mine” on an asteroid in order to colonize the moon (are you with me?) here’s how it would work. But if you’re a serious asteroid buff, the grand-daddy of all websites for facts and images is the Wikipedia website. Or are you just looking to have a piece of the heavens? The sky’s the limit! Assure her a permanent place in the cosmos by naming a star after her. The International Star Registry will send a parchment certificate with the copyrighted name of the star with the telescopic coordinates so she can locate her star! But if you’re a serious solar system buff, the grand-daddy of all websites for facts and images is the Solar System Astronomy website. StarChild covers the solar system, the universe and a variety of “space stuff,” with good links to other resources. Good illustrations and simple diagrams are with the explanations. Planet Diary features great visuals and a wealth of information that covers the globe, literally, from geology to meteorology. Keep your eye on outer space with Space.com They have the latest space exploration news, incredible photographs, and videos of space shuttle landings. Kids shouldn’t miss the SpaceKids section. There’s 4th of July fun at Kaboose. Activities, PC and Mac Downloads, Clip Art, Coloring Pages and more. Kid Safe Site. NovaOnline has expansive topics and sharp graphics that cover everything from survival on Mt. Everest to the treasures of an ancient, sunken city near Egypt. Check out Real Estate On Mars Here’s the definitive place to get all of the information on Mar’s real estate — brought to you by NASA and the Jet Prolusion Laboratory. You can view raw footage, panorama views, and 3-D images from both the Sprit and Opportunity Rovers. Ready to go? Get your ticket here. And if you want to be the first to buy a lot on Mars, here’s how to purchase a lot on Mars. But, bored with investing in Mars land? Try this land grab! 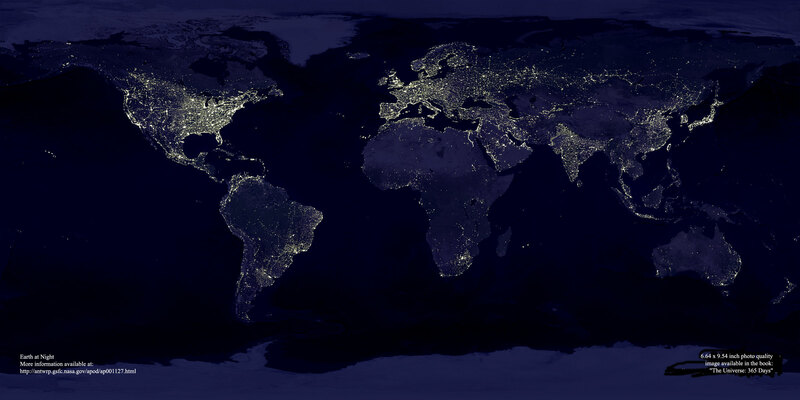 Take a look at NASA’s photo of the earth at night with all of the lights on. Give it a chance to load completely. It is mindboggling! And go further and farther to discover and learn more about the 8 planets. For a sampling of the world, the Degree Confluence Project offers an awe-inspiring photographic tour of our planet, from the rolling hills of New Zealand to the snowdrifts of Antarctica and more than 600 points in between. Been hankering to be the next space traveler? Then join the 20 teams from 5 countries who are part of the XPrize What is the XPrize? You will be blown away by its scope. SpaceDaily can take you pretty much anywhere in the solar system. Fireworks aren’t the only thing lighting our skies. For all you weather wonks, check out Lightning Storm, devoted to lightning and includes live lightning strikes occurring right now on its lightning-strike maps. Another is Live Lightning updated every 15 minutes. Lightning and Storms has the best. National Geographic educates your kids about lightning! And HowStuffWorks really has a lot of information about lightning. And last but not least, USAToday’s resource page. Here’s some July 4th Trivia Facts to share around the kitchen table. And while our flags are flying in the sky, think about some other reasons we can be grateful to our country. America’s No. 1 product, far more successful than even our entertainment, space and our technology, is our love of freedom. And I will be glad. To have this as my home. Here’s a very safe fireworks display for you to enjoy. Have a wonderful and safe Fourth!